Introduction by Croakey: Governments can be bad for mental health in so many ways. Think of Centrelink – an “incredibly stressful and frustrating” system for so many people. Think of being trapped below the poverty line on a Newstart allowance. Not to mention all of the other policies that increase inequality, which is a hazard for mental health and wellbeing across populations. 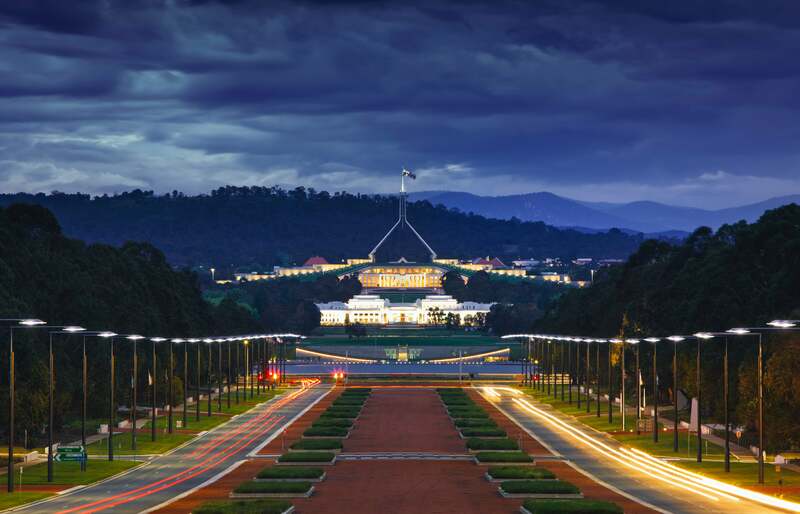 Think of the messages sent to Aboriginal and Torres Strait Islander people by Tony Abbott’s appointment as a special envoy for Indigenous Affairs, not to mention all of the other traumas that governments have caused Indigenous people over the years. Think of governments’ inaction on so many pressing issues that have a bearing on mental health – from racism to overincarceration, housing insecurity, childhood trauma, and climate change. Think of how a succession of governments, ministers and their agents have destroyed the mental health and wellbeing of so many asylum seekers and refugees, despite being clearly warned by medical experts of the predictable outcomes of their body-and-soul-destroying policies. So in many ways, it’s hardly news that governments, while liking to promote themselves as champions for mental health, are more often acting as culprits in worsening it. Minister Peter Dutton’s recent public questioning of the mental health of Roman Quaedvlieg, the former Australian Border Force commissioner, (which ratcheted up a level today), marks yet another low. As one psychiatrist told the New Daily, suggesting someone has a mental health disorder in order to discredit them “destroys all the good work” that has been done to reduce stigma associated with mental health problems. Dutton’s comments also raise some wider questions for the health system, suggests Dr Tim Senior, a GP who works in Aboriginal health and is a contributing editor at Croakey. 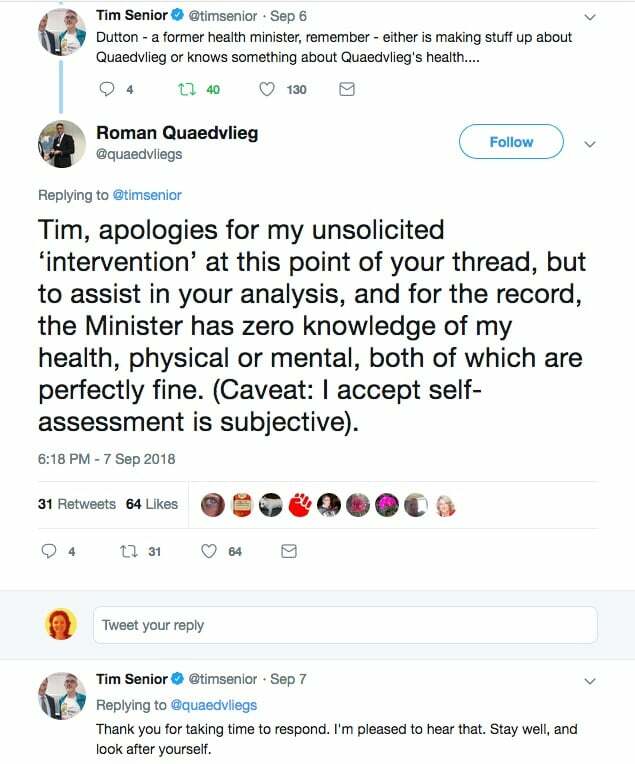 His tweets below were sent on 6 September, before Dutton’s attack under Parliamentary privilege today, and drew a response from Quaedvlieg that you can see below. 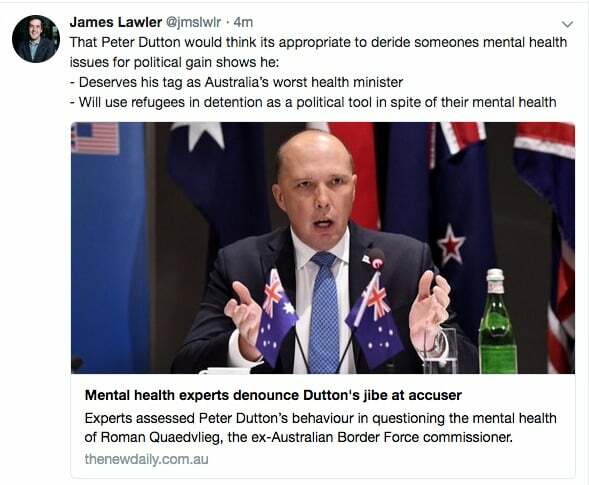 Peter Dutton has done a pretty disgusting thing in raising mental health as an issue for Roman Quaedvlieg – a quick thread…. Dutton can make a good case just by saying the dates in Quaedvlieg’s letter don’t add up. But he had to take a swipe at the man on his way through, using mental health…. Dutton – a former health minister, remember – either is making stuff up about Quaedvlieg or knows something about Quaedvlieg’s health…. If Dutton doesn’t know, and is making stuff up, then he is using mental health as a stigmatised insult. That’s a lot of Australians he’s insulting about their decision making right there…. But if Dutton knows, then he’s breaching confidentiality about someone’s health condition in order to take someone down politically…. If I did that, that would get me struck off the medical register, and quite rightly…. He is a member of a government struggling to implement a My Health Record over privacy concerns, and he may be demonstrating that he’s prepared to use confidential health information to hurt someone…. There are specific Medicare item numbers for use in mental health, required to get Medicare rebates for psychological care. Can we trust Dutton not to access this to hurt opponents?. I seriously hope I am wrong. I don’t think my values align with either Dutton or Quaedvlieg but this appears really bad to me. So many of my patients have mental health problems. They manage well. They are usually the result of a toxic living environment. TL;DR: MENTAL HEALTH IS NOT A WEAPON TO BE USED AGAINST POLITICAL OPPONENTS. FULL STOP.